The Preservation Society is a very particular company. The founder, Camille Wynne, may not always make pristine preserves from organic heirloom produce, she does make things filled with imagination and heart. The Preservation Society Home Preserves book contains 192 pages with 60 color photographs. Whether you're a beginner or a seasoned pro, you'll be comfortable making these recipes, which feature reliable, easy-to-follow, up-to-date preserving instructions and information. My grandmother taught me how to home can about 25 years ago and I've been doing it ever since. I am not a professional at it at all and basically can spaghetti sauce, tomatoes, pickles, apple sauce, pear sauce and various jams & jellies. This year though, I am going to expand my horizons!!! The Preservation Society Home Preserves book is fantastic! It is great for the beginner and the seasoned professional canner. All of the recipes are very easy to understand and I love that the author includes various tips and variations along the way. The foodie photography in this book is mouth-watering and entices you to try your hand at making the recipe. What I love the most about this book is that it includes all of the recipes that you basically would want to make when it comes to homemade preserves. Jams, jellies, chutney, marmalade and more! All of the things that I love to can! This book is really going to get a work-out once harvesting season comes my way later this summer and I am excited that I have it in my cookbook collection. 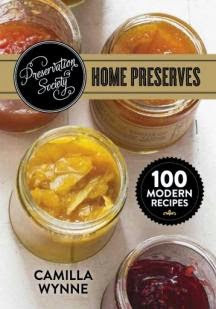 Giveaway: One lucky winner is going to win the Preservation Society Home Preserves book from Robert Rose. Value $24.95. Giveaway Details: This giveaway is open to residents of the USA ONLY who are age 18 and over. Please read the Terms of Service and Disclaimer Policy before entering. This giveaway will close on June 6th, 2015 at midnight EST time. I would love to add The Best of Bridge Slow Cooker Cookbook to my collection! I'm a big fan of Robert Rose cookbooks. I entered the Ziploc products giveaway at TCC. I went to their site and I would also love the 100 Best Asian noodle recipe book. The 125 Best Biscuit Recipe book sounds good. I would be interested in the 'The Essential Guide to Home Herbal Remedies' book. The Spice and Herb Bible would be nice. I just entered the TCC blog giveaway for Ziploc products. I entered the Bakedeco Whoopie Pie Pan giveaway at TCC. Over on TCC, I entered the ShoeBuy.com giveaway. I entered the Ziploc Storage Bags giveaway at TCC. I entered the ShoeBuy.com giveaway over at TCC. I repinned your recipe for Chocolate Chip and M & M Cookies. Looks good! I just entered the giveaway for a Bakedeco Whoopie Pie Pan at TCC. Those homemade whoopie pies look tasty! I entered the TCC Bakedeco Whoopie Pie Pan giveaway. The Spice & Herb Bible. The 250 Best Brownies, Bars and Squares. I entered the SNB: No-Churn Ice Cream Cookbook giveaway. I entered the ShoeBuy.com giveaway at TCC. I would also love the 200 Fast and Easy Artisan Breads book. I make all of our bread, so having some other recipes would be nice. I entered the TCC Brush Buddies giveaway. I entered the new Crane Cool Mist Humidifier giveaway at TCC. I entered the TCC Blast Zone Magic Bounce Castle giveaway. I've entered to win the Charles River Pack N Go Jacket at TCC. I just entered the Crane Cool Mist Humidifier giveaway over at TCC. I entered the Bakedeco Whoopie Pie Pan giveaway on the TCC blog. That would be a fun pan to bake with! I entered the Charles River Pack N Go Jacket giveaway at TCC because I could really use a casual rain jacket. I entered the TCC giveaway for a Bakedeco Whoopie Pie Pan. Thanks! I entered the giveaway for a gift card to ShoeBuy.com. I just entered the Bakedeco Whoopie Pie Pan giveaway at TCC, and I've got my fingers crossed! Whoopie pies are a big thing here in Maine, and it would be fun to make my own. I would love to have the book Bernardin Complete Book of Home Preserving.